The Arian controversy, theoretically resolved at the Council of Nicaea in 325, was a crossroads in the development of Christianity. There is virtually nothing else that all Churches, east and west, cite as the absolutely non-negotiable litmus test of Christian orthodoxy than the acceptance of that first ecumenical Council held under Imperial auspices early in the fourth century. What is most remarkable about the irrevocability with which the Council’s declarations have been embraced is that they represented an unprecedented innovation in Christian doctrine. The Council condemned the teachings of Arius of Alexandria who said that Christ was “God” only in a derived sense; like everything that exists, he was a creature. The Council declared, to the contrary, that Christ was not only divine but that his divinity was “the same as that of the Father.” That had never been explicitly stated by any Christian theologian prior to the Council without being condemned, and, it may be presumed, had never before been the officially sanctioned object of universal belief. … is not a story of embattled and persecuted orthodoxy maintaining a long and finally successful struggle against insidious heresy. It should be perfectly clear that at the outset nobody had a single clear answer to the question raised, an answer that had always been known in the church and always recognized as true, one which was consistently maintained by one party throughout the whole controversy. Orthodoxy on the subject of the Christian doctrine of God did not exist at first. The story is the story of how orthodoxy was reached, found, not of how it was maintained. There is no doubt that the pro-Nicene theologians throughout the controversy were engaged in a process of developing doctrine and consequently introducing what must be called a change in doctrine. Arius and Nicaea deals with the Arian dispute of the fourth century which occasioned the Council of Nicaea and the dogmatic declaration that Jesus was “God” of the same nature as the Father. The paper-back price is $14.92. You may also order by making a request in a comment on this page. Please list your address. Shipping to anywhere in the US is included in the price. Do NOT order through boundaryrockpublishers@gmail.com , that address is not longer operational. I hope you can find the time to read it. It will be well worth your while … you won’t encounter this perspective anywhere else. I am Sal Anastasio’s Vermont cousin. For years, he had told me that you and I have similar outlooks about materialism, but I never took it any further. 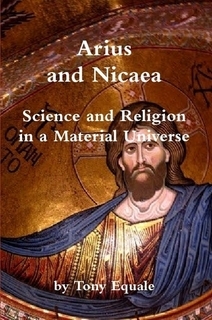 After his death, I decided to look up your works and have now read “Nicea … ” Sal, as usual, was quite right. I’d be pleased to converse with you a bit by email if you’d be willing. Believe it or not, I just now saw this comment. Today is Dec 17, 2017. I would be happy to correspond. Write to me at aequale. @swva.net.